Digital content is the number one way that women choose to discover trends in lifestyle categories such as beauty, fashion, food, fitness, and technology, but if forced to choose one source, would digital retain its position? 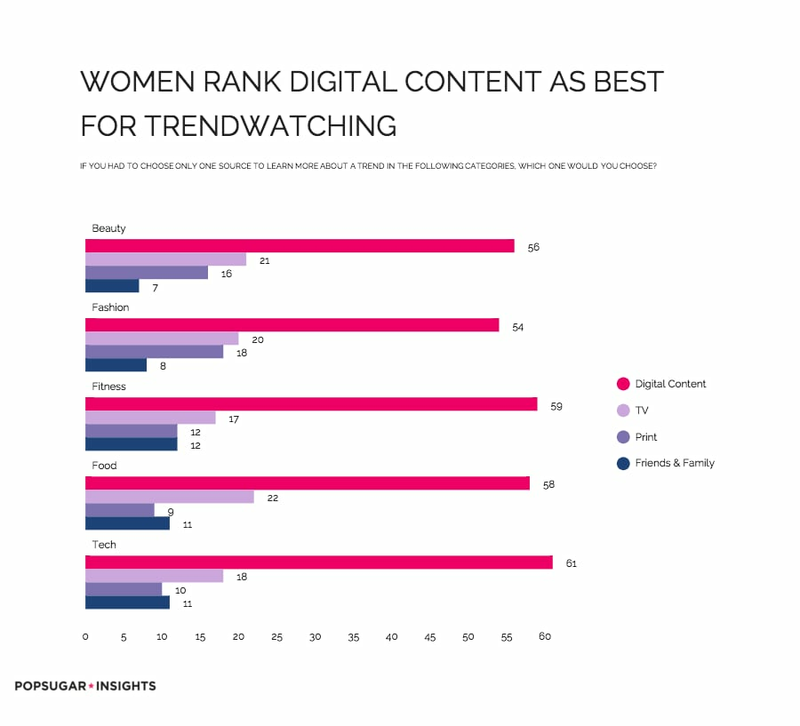 And which digital channels do women rely on the most? As part of the POPSUGAR Insights Content, Commerce, and Culture study, we surveyed over 1,500 women between the ages of 18-44 and asked them to choose their preferred source for learning more about trends in specific vertical categories. Overall, when asked to choose one source to learn more about trends in lifestyle categories, digital remains the primary choice for beauty (56%), fashion (54%), fitness (59%), food (58%), and technology (61%). Diving deep into the subcategories of digital content, we see exactly which resources are considered most essential to fueling discovery of popular trends. In every single lifestyle category, content websites ranked as the number one overall element of digital content that fuels discovery. For fitness (33%), food (33%), technology (33%), beauty (27%), and fashion (27%), content websites were the most popular choice. Following content sites, social media platforms ranked second overall. For technology (19%), fashion (19%), beauty (19%), fitness (17%), and food (16%), social media would be the platform of choice.